The Autobots clash with KSI in the Hong Kong Pursuit from Transformers: Age of Extinction. Decepticon Stinger materializes from Transformium to blast firepower at opponents. He scales skyscrapers pursuing his prey until Autobot enforcements storm the city. 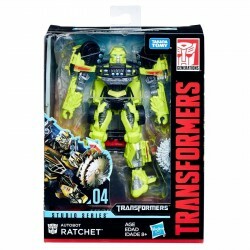 This Studio Series 02 Deluxe Class Movie 4 Decepticon Stinger figure converts from robot to sports car mode in 21 steps and comes with 4 weapon accessories. Remove backdrop from a pack to showcase the elusive KSI warrior in the Hong Kong Pursuit scene. 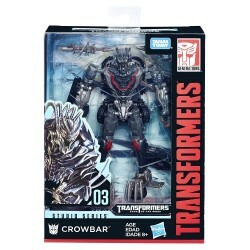 • Includes Transformers Studio Series 02 Deluxe Class Movie 3 Decepticon Stinger figure, 4 accessories, removable backdrop, and instructions.